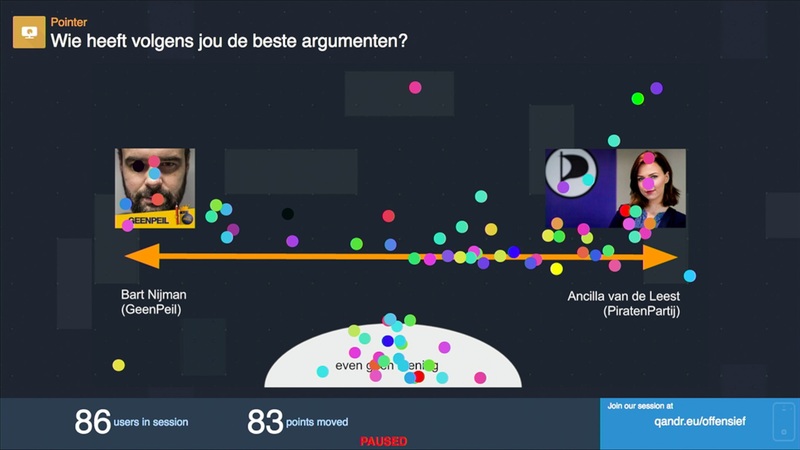 We are very proud to announce that QANDR was successfully used during a debate on the Dutch election. The debate was organised by I&O Research and the organisation More Democracy in the top floor conference room of the UP building in Amsterdam. Discussion leader Niesco Dubbelboer used QANDR in several ways to create interaction with the audience of ninety. 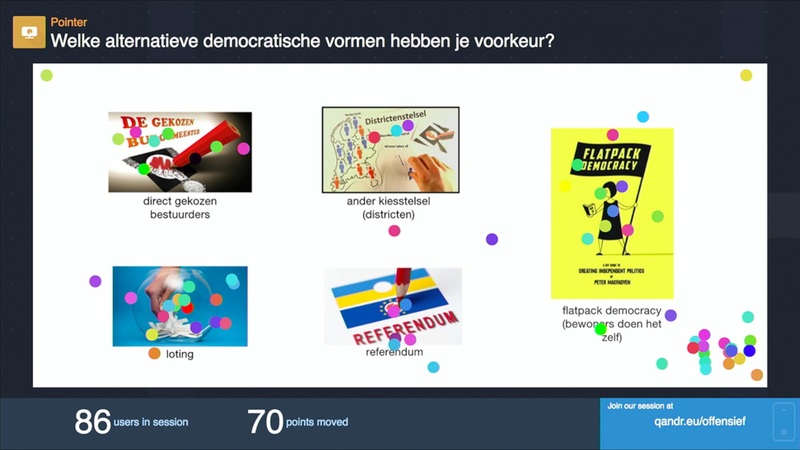 At the start of the debate the pointer was used to visualise the places of residence of the people in the audience on a map of the Netherlands. 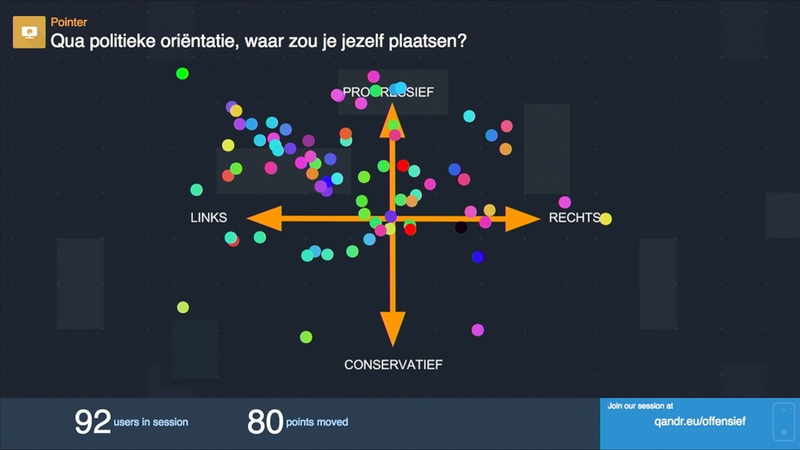 Niesco then used the same method to ask the audience to indicate their political orientation inside a quadrant with left-right and progressive-conservative dimensions. 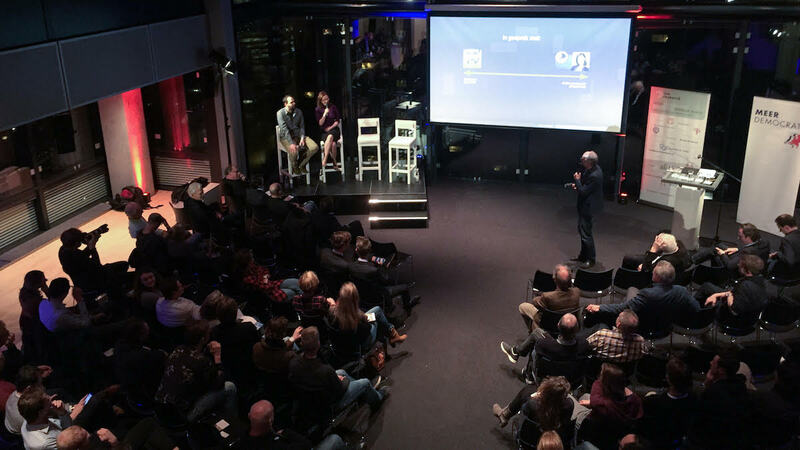 The evening featured a debate between Ancilla van de Leest from the Piracy Party and Bart Nijman from Geenpeil, both newcomers on the Dutch political party landscape. In this debate the pointer was used twice to indicate which of the speakers the audience felt had the best arguments. 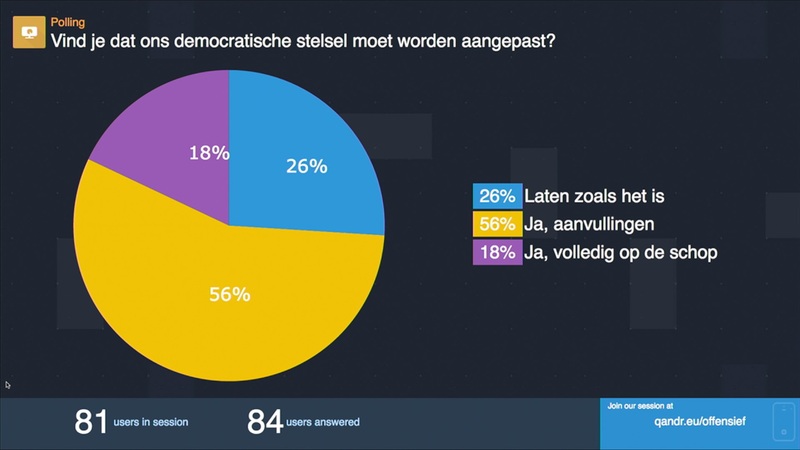 In the second part of the evening Niesco used a QANDR poll to find out from the audience whether they believe the current political model should be adjusted with extra democratic tools like the referendum or a directly elected mayor. It was interesting to see how audience opinions influenced the discussion on stage and how some people raised their voice when they felt the visualisation of alternative models (again a pointer) did not contain all the options they wanted. All in all it proved to be quite a successful evening, with the application being able to capture the viewpoints of the ninety people in the room, and audience involvement clearly providing additional focus for the discussion on stage. A very nice example of how a hundred-odd smartphones, instead of being a distraction, can help to create a more focused discussion. Click here to see a pdf with the evening’s impressions. Noterik is an Amsterdam based company specialised in the development of multiscreen applications.